This is lovely if you have four minutes to spare. Consequence of Sound report: “After political happenings Friday handed 45 the second major loss of his two-month-old presidency, it feels like a good time to be part of the #Resistance. Now is not the time to rest, however, as there will be plenty of chances to press the advantage in the near future. That’s why the Our First 100 Days series is continuing on today with a reminder that true freedom must be fought for constantly. 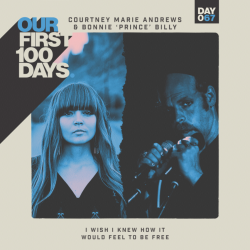 For the latest entry in the benefit compilation, folk singer-songwriter Courtney Marie Andrews has teamed with Bonnie ‘Prince’ Billy (aka Will Oldham) for a cover of “I Wish I Knew How It Would Feel to Be Free”. The song was made famous when Nina Simone recorded a version in 1967. Hers was a steadily building gospel track that maintained some of the original’s jazz feel; on their take, Andrews and Oldham add in their own indie folk vibe to the mix.